You may download files with publications only if you will be using them strictly for educational and academic purposes, you or your institution have access rights to these papers, and you respect the copyright of the respective journals. * Indicates the corresponding author. Berney Peng, Mohammad Almeqdadi, Fabrice Laroche, Shajesh Palantavida, Maxim Dokukin, Omer H. Yilmaz, Jatin Roper, Hui Feng, Igor Sokolov*Data on ultrabright fluorescent cellulose acetate nanoparticles for imaging tumors through systemic and topical application” Data in Brief, Volume 22, February 2019, Pages 383-391. Berney Peng, Mohammad Almeqdadi, Fabrice Laroche, Shajesh Palantavida, Maxim Dokukin, Omer H. Yilmaz, Jatin Roper, Hui Feng, Igor Sokolov*, “Ultrabright fluorescent cellulose acetate nanoparticles for imaging tumors through systemic and topical applications “, Materials Today(IF 25), in press, https://doi.org/10.1016/j.mattod.2018.11.001. I. Sokolov*, M. E. Dokukin†,V. Kalaparthi†, M. Miljkovic†, A. Wang, J. D. Seigne, P. Grivas, E. Demidenko, “Noninvasive detection of bladder cancer using machine-learning-based analysis of nano-resolution images of cells from urine”, Proceedings of the National Academy of Sciences (PNAS), 2018. 115(51): p. 12920-12925. Pei-Hsun Wu, Dikla Raz-Ben Aroush, Atef Asnacios*, Wei-Chiang Chen, Maxim E. Dokukin, Bryant L. Doss, Pauline Durand, Andrew Ekpenyong, Jochen Guck, Nataliia.V. Guz, Paul A. Janmey*, Albrecht Ott*, Robert Ros*, Yeh-Chuin Poh, Mathias Sander, Igor Sokolov*, Jack R. Stuanton, Ning Wang*, Denis Wirtz* “ A comparison of methods to assess cell mechanical properties “, Nature Methods,(IF 25.1) 15, pages 491– 498 (2018) click to download. PM Echols-Jones, ME Dokukin, I Sokolov*, WC Messner*, “Improved Scanning Speed of AFM Subresonant Tapping Mode with Switched Dual-Actuator Control” In proceedings of American Control Conference(ACC) ACC 2018: 6451-6456, DOI: 10.23919/ACC.2018.8431164d. PM Echols-Jones, I Sokolov, WC Messner "FEEDBACK CORRECTION IN SUB-RESONANT TAPPING MODE OF AN ATOMIC FORCE MICROSCOPE", US Provisional application, 2018, full patent submitted. Maxim E. Dokukin, Igor Sokolov, “Nanoscale compositional mapping of cells, tissues, and polymers with ringing mode of atomic force microscopy", (Nature) Scientific Reports, (IF4.3) 7, Article number: 11828 (2017) click to download. Maxim E. Dokukin, Nataliia V. Guz, Igor Sokolov*, “Mechanical Properties of Cancer Cells Depend on Number of Passages: AFM indentation study”, Jap. J. of Applied Physics, v.56, paper 8S1, 2017; click to download. 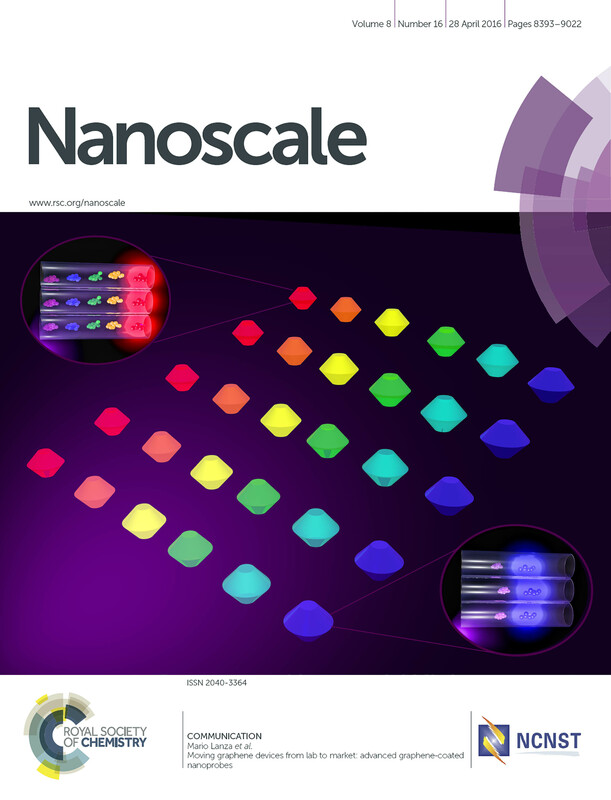 S. Palantavida, B. Peng, I. Sokolov*, Ultrabright fluorescent silica particles with a large number of complex spectra excited with single wavelength for multiplex applications, Nanoscale, (IF7.8) 2017, 2017, 9, 4881-4890 (title page). click here . V. Kalaparthi, S. Palantavida, N.E.Mordvinova, O.I. Lebedev, I. Sokolov. Self-assembly of multi-hierarchically structured spongy mesoporous silica particles and mechanism of their formation, J of Surf.Coll.Sci. (IF3.8) 491 (2017) 133–140. click to download. I.Sokolov, A. Katyshev, “Nanoeconomics: a statistical model of company profit influenced by individual interests of managers", Applied Economics and Finance, v.4, issue 1, 2017, click to download. Sokolov, I. *, M. E. Dokukin “Fractal Analysis of Cancer Cell Surface “, Methods in Molecular Biology. (Springer Series), Methods Molecular Biology, Vol. 1530, Reema Zeineldin (Eds): Cancer Nanotechnology, 2017, 978-1-4939-6644-8, 334233, click here. I. Sokolov, V. Kalaparthi, D.O. Volkov,, S. Palantavida, N.E.Mordvinova, O.I. Lebedev, J. Owens. Control and formation mechanism of extended nanochannel geometry in colloidal mesoporous silica particles , Phys.Chem. Chem.Phys. (IF4.5),2017, 19, 1115. click to download. 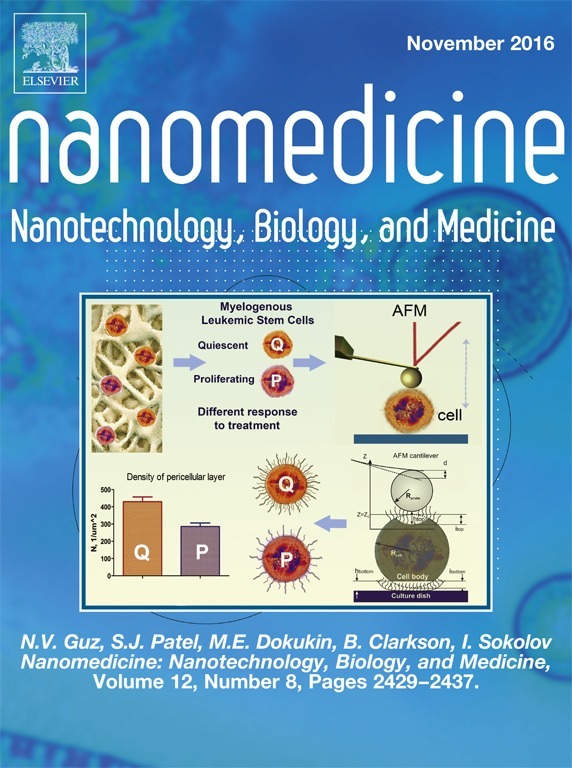 Nataliia V. Guz, Sapan J. Patel, Maxim E. Dokukin, Bayard Clarkson*, Igor Sokolov*, “Prominent physical changes in elasticity and pericellular layer in human acute leukemic cells due to inadequate cell-cell communication”, Nanotechnology, v.27, n.49, 49400, click to download. Piers Echols-Jones, M.E. Dokukin, I. Sokolov, W.C. Messner, “Advanced Manual System Identification Using Lead and Lag Compensators with Complex Poles and Zeros”, in Proceeding of ASME 2016 Dynamic Systems and Control Conference , paper 9854. M. Dokukin, Y. Ablaeva, V. Kalaparthi, A.Seluanov, V. Gorbunova*, I. Sokolov*, “Pericellular brush and mechanics of guinea pig fibroblast cells studied with AFM”, Biophysical Journal (IF4), 2016, v.111 ,pages 236-246. click here. E. Spedden, M.Dokukin, V. Kalaparthi, M. Simon, I. Sokolov*, C.Staii* “Load Rate and Temperature Dependent Mechanical Properties of the Cortical Neuron and Its Pericellular Layer Measured by Atomic Force Microscopy”, Langmuir.,(IF4) 2016, 32, 1111-1119. click here. Sokolov, I*. Zorn,G. and Nichols J.M. “A study of molecular adsorption of a cationic surfactant on complex surfaces with atomic force microscopy” Analyst (IF4.1), 2016, 141, 1017-1026. click here. United States US Patent 9,417,170. Sokolov, I. *, M. E. Dokukin “Study of fractal behavior of cell surface gives a hint to a new way of attack on cancer”” 2Physics, click here. Dokukin, M.; Guz, N.; Woodworth, C., Sokolov, I. * Emerging of fractal geometry on surface of human cervical epithelial cells during progression towards cancer, New Journ. of Physics (IF4.0), 2015, v. 17 033019 (chosen for 2015 highlight papers of this journal). Igor Sokolov*, Natali V. Guz, Swaminathan Iyer, Amy Hewitt, Nina A. Sokolov, Joseph S. Erlichman, Craig D. Woodworth, “Recovery of aging-related size increase of skin epithelial cells: in vivo mouse and in vitro human study”, PLoS One (IF 3.53), 2015 Mar 25;10(3):e0122774. doi: 10.1371/journal.pone.0122774. N. Guz, M. Dokukin, V. Kalaparthi, and I. Sokolov* “If cell mechanics can be described by elastic modulus: study of different models and probes used in indentation experiments”, Biophysical J.,(IF4) 2014 Aug 5;107(3):564-75. Pantelavida, S., Guz N., Woodworth, C.D., Sokolov, I*.Ultrabright fluorescent mesoporous silica nanoparticles for prescreening of cervical cancer, Nanomedicine, 2013 May 9. pii: S1549-9634. Dokukin, M., N. Guz, Sokolov, I*. Quantitative Study of the Elastic Modulus of Loosely Attached Cells in AFM Indentation Experiments, Biophysical Journal, 2013, 104(10):2123-31. Dokukin, M., Sokolov, I*.”On quantitative mapping of elastic modulus of soft materials with HarmoniX and PeakForce QNM AFM modes”, Langmuir, 2012, 28 (46), pp 16060–16071. N. Bocharova, O. Zavalov, Kevin MacVittie,Mary A. Arugula, N.V. Guz M.E. Dokukin, J. Halámek, I. Sokolov,* Vladimir Privman,* Evgeny Katz* 'Biochemical Logic Approach to Biomarker-Activated Drug Release’ J. Mater. Chem., 2012, v.22, p. 19709-19717. Sokolov, I.*,V. Kalaparthi, M. Kreshchuk, M.E. Dokukin, "On averaging force curves over heterogeneous surfaces in atomic force microscopy", Ultramicroscopy, 2012, v.121, p. 16-24. Dokukin, M., Sokolov, I*. “On the measurements of rigidity modulus of soft materials in nanoindentation experiments at small depth”, Macromolecules, 2012, v.45 (10), p. 4277–4288. I.Sokolov*, “Toward the nanoscale study of insect physiology using an atomic force microscopy-based nanostethoscope”, MRS Bulletin, 2012, v.37, p.522-527. K.S. Iyer, R.M. Gaikwad, C. D. Woodworth, D.O. Volkov, I.Sokolov*, “Physical labeling of papillomavirus-infected, immortal, and cancerous cervical epithelial cells with fluorescent silica beads”, Cell Biochemistry and Biophysics, 2012, vol. 63(2), p.109-116. M. E. Dokukin, N. V. Guz, R. M. Gaikwad, C.D. Woodworth, I. Sokolov*, “Cell surface as fractal: Normal and cancerous cervical cells demonstrate different fractal behavior of surface adhesion maps at the nanoscale”, Phys. Rev. Lett. 107, 028101 (2011). E.-B. Cho, D.O. Volkov, I. Sokolov*, ”Ultrabright Fluorescent Silica Mesoporous Silica Nanoparticles: Control of Particle Size and Dye Loading” Adv. Funct. 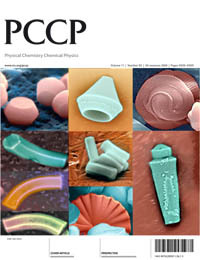 Materials, 2011, v.21, pp.3129-3135. D. O. Volkov, P. R Veera Dandu , H. Goodman, B. Santora, I. Sokolov* “Influence of Adhesion of Silica and Ceria Abrasive Nanoparticles on Chemical-Mechanical Planarization of Silica Surfaces”, 2011, Applied Surface Science, Volume 257, Issue 20, 1 August 2011, Pages 8518–8524 . M. Dokukin, N. Guz, R. Olac-Vaw, V. Mitin, and I. Sokolov* “On possible use of capped quantum dots in memory devices”, J. of Comp. and Theor. 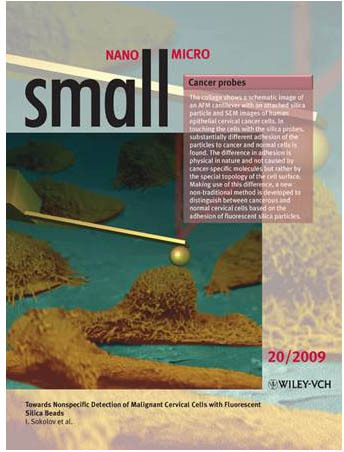 Nanoscience, 2011, Vol. 8, 1–4, . Ravi M. Gaikwad, Maxim E. Dokukin, K. Swaminathan Iyer, Craig D. Woodworth, Dmytro O. Volkov, Igor Sokolov*, “Detection of cancerous cervical cells using physical adhesion of fluorescent silica particles and centripetal force”, Analyst, 2011, 136, 1502. S. Li, N.V. Guz, I.Sokolov*, “A modified in-vitro stripping method to automate calculation of geometry of corneocytes imaged with fluorescent microscopy: example of moisturizer treatment”, Skin Research and Technology, 2011, v.17, p. 213-219. Natalia V. Guz, Maxim E. Dokukin,and Igor Sokolov*, “Atomic force microscopy study of nano-physiological response of Ladybird beetles to photostimuli”, PLoS One, 2010, 5 (9), 20877638. Eun-Bum Cho, Dmytro Volkov, Igor Sokolov*, “Ultrabright fluorescent mesoporous silica nanoparticles”, Small, 2010, v.6 (20), p. 2314-2319. R. M. Gaikwad, S. I. Vasilyev, S. Datta, I. Sokolov* " Atomic force microscopy characterization of corneocytes: effect of moisturizer on their topology, rigidity, and friction", Skin Research and Technology, 2010; 16: 275–282; doi: 10.1111/j.1600-0846.2010.00446.x. I. Sokolov*, Volkov, D. “Ultrabright fluorescent mesoporous silica particles”, J. Mater. Chem., 2010, 20, 4247–4250 (highlight article).